Gendun Drubpa Buddhist Centre is a teaching and meditation centre in the Tibetan Buddhist tradition of the Dalai Lama located in the heart of Williams Lake, in central British Columbia. Our goal is to provide a welcoming and contemplative environment where everyone can experience the teachings of the Buddha and we can all deepen our understanding of the Buddhist spiritual path. We offer a range of classes in meditation and Buddhist philosophy for students at every level of experience. Join us for a class or meditation session today! We are a non profit organization and rely on the generosity of our students and benefactors. Developing the attitude of cherishing others is the whole point of the study and meditation that we do; the classes we hold and books we read are leading us to a state of mind where we are incredibly happy to have a chance to serve others. This attitude is exemplified for us by the way our Spiritual Director Kyabje Zopa Rinpoche lives his life, cherishing each being he meets. We welcome people of all races, cultures, ethnicities, sexual orientations, gender identities, classes, religions, abilities and ages. We are committed to providing a safe place for all people to explore the Dharma and awaken to their true nature. To provide a welcoming and contemplative environment where individuals can receive Buddhist teachings based on the tradition of Lama Tsong Khapa as taught by our Spiritual Director Kyabje Zopa Rinpoche. To offer integrated Buddhist educational programs where our minds and hearts can be transformed into our highest potential for the benefit of all other beings. To foster the spirit of peace, non-violence and compassion in our world, following the principles of universal responsibility as exemplified by His Holiness the Dalai Lama. Our center is named after the First Dalai Lama, Gendun Drubpa. Gendun Drup was born in a cowshed in Gyurmey Rupa, near Sakya in the Tsang region of central Tibet, the son of Gonpo Dorjee and Jomo Namkha Kyi, nomadic tribespeople. He was raised as a shepherd until the age of seven. Later, he was placed in Narthang Monastery. In 1405, he took his novice vows from the abbot of Narthang, Khenchen Drupa Sherab. When he was 20 years old, in about 1411, he received the name Gendun Drubpa upon taking the vows of a fully ordained monk from the abbot of Narthang Monastery. Also at this age, he became a student of the great scholar and reformer Tsongkhapa (1357–1419), who some say was his uncle. 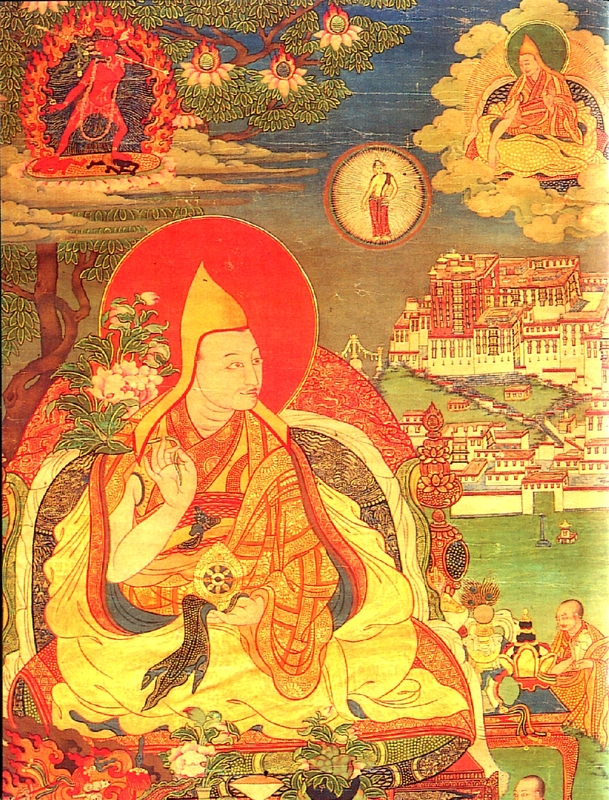 Around this time he also became the first abbot of Ganden Monastery, founded by Tsongkhapa himself in 1409. By the middle of his life, Gendun Drup had become one of the most esteemed scholar-saints in the country. Gendun Drubpa founded two major monasteries: Drepung and Tashilhunpo. He remained the abbot of Tashilhunpo Monastery until he died while meditating in 1474 at the age of 84.